"The idea is, to produce a blend so perfect that it strikes the consumer as being one liquid, not many - i.e. having absolute unity, tasting as one whole." The above quote is from a book called 'How To Blend Scotch Whisky' by the much-lauded 19th Century whisky writer Alfred Barnard. After spending the better part of two years traversing what was then the British Isles, Barnard visited all 162 of the working distilleries across England, Wales, Scotland and Ireland. The culmination of his pilgrimage was the book The Whisky Distilleries of the United Kingdom still often quoted today and providing an invaluable snapshot of whisky distilling in the 1800's. In the above quote, Barnard is extolling the virtues of blended whisky. "Very many persons think they can blend whisky, and that it is just a matter of throwing a few brands together. 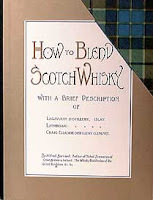 The manipulation of whiskies requires as much care as the most delicate wines." Quite a claim and not one many of us think about when quaffing a Bells and ginger ale down the local, in our youth. But the man was bang on. The process of blending is a complex art and one which can be lost in the folly of youth or the arrogance of old age, when we believe that single malts provide a superior product to that of the blended whisky. 1. Take your hands and place them firmly on your shoulders. 2. With some force, pull downwards on your shoulders until you hear a loud 'popping' sound. 3. At this stage, you should find that your head has now been removed from your arse. Herein lies a warning: the light can be rather blinding, but embrace it. 4. Once your eyes are fully open, find your nearest bar and order a large dram of a blended whisky. Spend no more than £7 (but no less than £3) and sit back, relax and enjoy the way the liquid has been constructed, the artistry behind the flavour. At the start of this week, I was kindly invited up to Dufftown in the heart of the Speyside region, to the Glenfiddich distillery. "Great!" I hear you cry. "They make some lovely single malts there. What's this review going to be? A new 14 year old? Maybe a wacky finish [easy now! - Ed]? Or something really old? How about a 55 year old??" Nope, none of those. And may I refer you to instructions 1 through to 4, above. For Glenfiddich is not just the home of the single malt to which it gives its name. Yes, it produces some lovely drams. Yes, The Balvenie is a mere stumble away, also producing some fantastic hooch. No, we didn't get to visit Kininvie distillery. Again. But we did get to discover the very reason why these distilleries were built... to supply blended whisky. Born in Dufftown in 1839, William Grant was a humble accountant, the bookkeeper at Mortlach distillery. However, his ambitions were great and soon he was installed as the manager at the distillery. During his time there, he began planning to build his own distillery and in 1886 he quit his job, bought some land and built the Glenfiddich distillery, which ran its first distillation on Christmas Day, 1887. One of the reasons that William Grant was able to build his distillery was due to an exclusive contract he had with a major blender of the day, the brilliantly named William Williams. A few years later, William Grant saw an opportunity when the largest blending company of the day, Pattison's (who ironically also make sausages) went bankrupt, and he was able to launch his own blend. Thus Grant's Whisky was born and today has climbed to the dizzy heights of the world's third largest Scotch whisky brand by sales volume. Quite an achievement. Right, back to the present day. Quite rightly, a lot of companies are pretty proud of their history, so most employ an archivist, and Grant's is no exception. The man in question, whose job it is to keep on top of an ever expanding archive, is called Paul Kendall, a bloody nice chap whom I had the pleasure of having lunch with. Anyway, some time ago Paul discovered the company’s oldest blending book, in which is recorded the exact whiskies that William Grant used to create his first blend, Grant’s Stand Fast. The date on these records was 11 June 1912; clearly some time after the very first blend was made, but the very first records these remain, nonetheless. The task ahead was not easy. There was no reference point for the actual liquid; no smoking gun, save for the records. There was one obvious issue: whisky production has changed a lot over the past 100 years. Greater consistency in grains, yeast, distilling and casks mean we have no real touch point for what the constituent parts would have really tasted like. But no bother; this is 2012 and we'll work with what we have... some educated guess-work and selection of, hopefully, similar casks. Now, the original recipe was made up of 18 whiskies, a lot less than makes up a standard batch of a blend today. And the youngest was listed at just two years old. Something that, due to tight (some would even say 'restrictive' SWA regulations...) means we can't exactly replicate. Plus, there were some whiskies listed (mainly the grains) which came from closed distilleries (Cambus, Caledonian and Port Dundas). But fear not! Brian had been digging around in the Grant's warehouses and found casks of each of these. Winner! We started by constructing a grain whisky base. Once this had been built (and seriously, some of those grains, particularly the 1985 Caledonian were just fantastic) and we were pleased with the balance, it was time to create a topdressing by blending together some of the malts. The grain base had taken a couple of shots until we were happy to proceed, and the same was true with the malt selection. In the research and chat beforehand, we came to the conclusion that the malts from this period would have nearly all been peated to some degree. The only island malt listed in the original blending book was Highland Park and Brian had uncovered some peated Glenfiddich and peated Balvenie. What a treat. 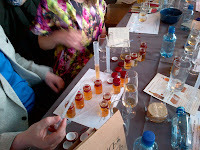 These, along with some unpeated 'fiddich and 'venie, were to make up our malt content. Initially, the blend came off too smoky, too powerful and too aggressive. Pulling back on the smoke and dipping in some of the aged grains, we finally got to a point where the team was happy. Was it 'Stand Fast' as William Grant would have know it? Who knows. Was it tasty? Hell, yes! As the individual parts to our blend were all at natural cask strength, one of the questions posed was how, in the early 1900's, was the whisky filtered? In a time before chill filtration, whisky still had the issue of going cloudy when water was added, or if the bottle was left in the cold. Eggs. Apparently eggs are the answer. If you crack in some egg white and leave for a few days, these attract the fatty acids which turn the liquid cloudy. Filtering out the egg white then does a similar job to the modern day effort of chill filtration... So, true to whisky production at the time, Brian added egg white to the whisky and the concoction was left to marry in demijohns before it goes on to be bottled. Over the year, we have been hosting a series of whisky tastings in conjunction with the Southbank Centre in London, having their members come along to the Royal Festival Hall to learn about whisky in all forms; from single malts to blends to world whiskeys. "The greatest amount of ignorance prevails in England on the subject of blending... ". I'm glad this was written at the end of the 1800's, as I hope, with initiatives like the Grant's trip and classes like ours, the opposite can be said in 2012.